Since there are four memory slots, it can be expanded up to 64GB. However, 16GB should be plenty enough for most games. If you’re looking for an entry-point VR-ready machine, this one is a great start. It has an excellent design with features such as pulsing multicolor LED lights, which respond to music and sound. You can even customize the lights in any way you like by using the pre-installed PredatorSense software. This software also displays important system info like fan speed and temperature. Some would even call the design “aggressive”, with not only the pulsing lights, but with the armor-inspired way it is constructed as well. The top and front panels make the machine look like a tank tread. The side panels are red-lined and feature bold angles. The backside is entirely red. The only traditional thing about the design is the “Predator” logo. The supported wireless protocols are 802.11 ac technology and Bluetooth 4.1. For I/O expansion, there is 1 2.5-inch internal bay and a PCI Express x16 slot. For connecting the Acer Predator G1 G1-710-70005 to a display, HDMI, DisplayPort, and DVI are all included. There are 5 USB 3. 0ports and 6 USB ports in total, as well as RJ-45. With 7.1 channel audio and SoundBlaster X-Fi MB5 technology, you’ll really be immersed in any game you play. Everything – from your own voice to background sound effects – will be amplified. Additional features of this computer include a 460-W maximum power supply wattage, Windows 10 Home operating system (64-bit), and audio line in / out. Select configurations come with a mouse and keyboard that match the design of the tower. According to Acer Predator G1 G1-710-70005 reviews, some of the best things about the PC are its Intel Core i7 processor, good FPS in games, superfast Wi-Fi connection, and RGB lighting. It’s no secret that Acer deals are among the best in the computer industry. The brand is known for its affordable, quality PCs. 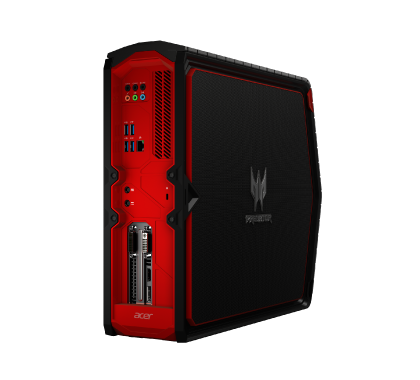 If you are thinking of purchasing a good gaming desktop, you can use Acer Predator G1 G1-710-70005 discounts to help you get it at an even lower price.